Don't deprive yourself of a truly delicious burger. 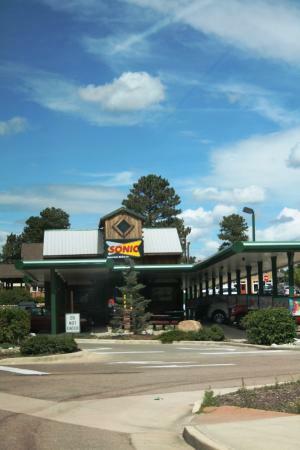 Drive in to your nearest SONIC®, push the red button and tell 'em you want one of those extraordinarily tasty, doesn't-taste-like-fast-food, fast-food burgers. Then prepare to be delighted. Select a menu item below. Double the SONIC® goodness with the SuperSONIC® Cheeseburger. Two perfectly seasoned 100% pure beef patties topped with crinkle-cut pickles, chopped onions, fresh shredded lettuce and ripe tomatoes with your choice of mustard, mayo or ketchup. Seeing double has never been tastier. Get​ your beef and cheese sandwiched between two thick slices of Texas Toast. Then top it off with crinkle-cut pickles, chopped onions, fresh shredded lettuce, ripe tomatoes, a freshly prepared onion ring and hickory BBQ sauce. It's the ultimate burgwich. We​ can't help make summer last longer, but we can stretch out your delicious Coney. Our new Footlong Quarter Pound Coney is a juicy, plump footlong hot dog topped with warm chili and melty cheese. Got love for the Windy City? Then try SONIC's Premium Beef Chicago Dog. A beef hot dog made with 100% pure beef and topped with pickle, relish, tomato, sport peppers, celery salt and mustard all served up in a soft, warm poppy seed bun. 100% all white meat grilled chicken breast topped with fresh lettuce, tomatoes and mayonnaise served on a wheat bun made with whole grain. *Wheat bun contains 10 grams of whole grain. Enjoy a crispy snack, or put together the perfect combo meal with our Jumbo Popcorn Chicken,® made with juicy all white meat. Choose from ranch, goney mustard or Hickory BBQ dipping sauce. Crispy all white meat chicken strips, fresh lettuce, tomatoes and light ranch dressing wrapped up in a warm flour tortilla. Come taste BBQ flavor that'll make your mouth jump off your face to say thank you. The all-new Hickory Flatmelt Sandwiches come with your choice of marinated sirloin steak, grilled or crispy all-white meat chicken breast with crisp bacon, cheddar cheese, hickory BBQ sauce, and grilled onions wrapped up in a soft, warm flatbread. Come​ taste BBQ flavor that'll make your mouth jump off your face to say thank you. The all-new Hickory Flatmelt Sandwiches come with your choice of marinated sirloin steak, grilled or crispy all-white meat chicken breast with crisp bacon, cheddar cheese, hickory BBQ sauce, and grilled onions wrapped up in a soft, warm flatbread. You​ know what they say: A few crisp Apple Slices a day dipped in fat-free caramel dipping sauce are delicious. Pop some of these crispy little potato pieces in your mouth and you'll never think of a spud the same way again. Top them with chili and cheese, or get them plain. They're SONIC® good no matter how you eat them. Crispy, golden brown sticks of potato goodness. Get 'em with your Combo or on their own. You can even smother them with warm chili and cheese. But who are we to tell you how to eat? Feed your sweet tooth a snack. Crispy and creamy new Cheesecake Bites are little wonders of cheesecake rolled in golden graham cracker crust and fried to perfection with strawberry dipping sauce. If you're still hungry, you can always have more cheesecake bites. Bring your thirst to Sonic and enjoy half-price drinks and slushes from 2 to 4 p.m., every day.† There are 398,929 fountain drink and slush combinations to choose from. Select a menu item below. Feel like cooling down and refreshing with a SONIC® good soft drink? We know the feeling. We're told the secret is our famous SONIC® ice. But you didn't hear that from us. Nothing beats sitting in the driver's seat with an ice-cold Coca-Cola® drink in your hand. No, really. Nothing. Nothing beats sitting in the driver's seat with an ice-cold Diet Coke® drink in your hand. No, really. Nothing. Nothing beats sitting in the driver's seat with an ice-cold Dr Pepper® drink in your hand. No, really. Nothing. Nothing beats sitting in the driver's seat with an ice-cold Diet Dr Pepper® drink in your hand. No, really. Nothing. Nothing​ beats sitting in the driver's seat with an ice-cold Sprite® drink in your hand. No, really. Nothing. Nothing beats sitting in the driver's seat with an ice-cold Sprite Zero® drink in your hand. No, really. Nothing. Nothing beats sitting in the driver's seat with an ice-cold Barq's® Root Beer in your hand. No, really. Nothing. Nothing beats sitting in the driver's seat with an ice-cold Minute Maid® Lemonade in your hand. No, really. Nothing. Welcome to Frozen Zone. Here you'll find a whole menu of cold and tasty treats. Mmm Mmm MmmMmmMmm. Select a menu item below. Candy and real ice cream the way they should be. All mixed up. Sweet, cold, real vanilla ice cream blended with pieces of OREO® cookies. Sweet, cold, real vanilla ice cream blended with colorful, chocolaty M&M's® candies. Sweet, cold, real vanilla ice cream blended with rich, peanut-buttery Reese's Milk Chocolate Peanut Butter Cups®. The gooey, chocolate-y, nutastic taste of your favorite candy bar. With creamy, real ice cream and caramel blended into a cold cup of sweetisfaction. In the mood for something cold and creamy? Then get off the computer and in to SONIC® for a tasty shake. Typisch sonic. De persoon op de luidspreker was moeilijk te begrijpen en de persoon bij het raam had moeite met tellen veranderen. Jonge medewerkers, maar vriendelijk. Altijd druk, maar het personeel is rumoerig. Altijd lekker! Echt goede hamburgers en hotdogs en tator tots met kaas! Een van de heerlijkste sonics! Krijg snel antwoord van medewerkers en voormalige gasten van Sonic Drive-In.